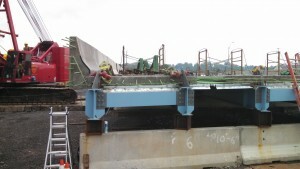 by Tom Macioce P.E., Chief Bridge Engineer, PennDOT; Harivadan Parikh P.E., District Bridge Engineer, PennDOT District 8. Description: In June 2015 the Pennsylvania DOT replaced the three-span Route 581 Bridge in the borough of Lemoyne in Cumberland County. With 86,000 vehicles a day traveling across the bridge, ABC was used to limit closures to several weekends instead of the typical 1.5 years that would have been required to replace this bridge using conventional methods. The superstructure spans were prefabricated in a nearby staging area. 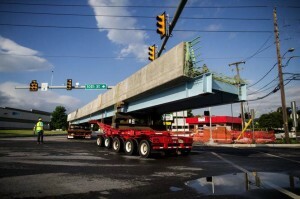 The bridge was closed from 9 pm Friday to 6 am Monday, and spans were transported to the site and lifted into place. This presentation describes the planning, design, fabrication, and construction details of this successful ABC project.